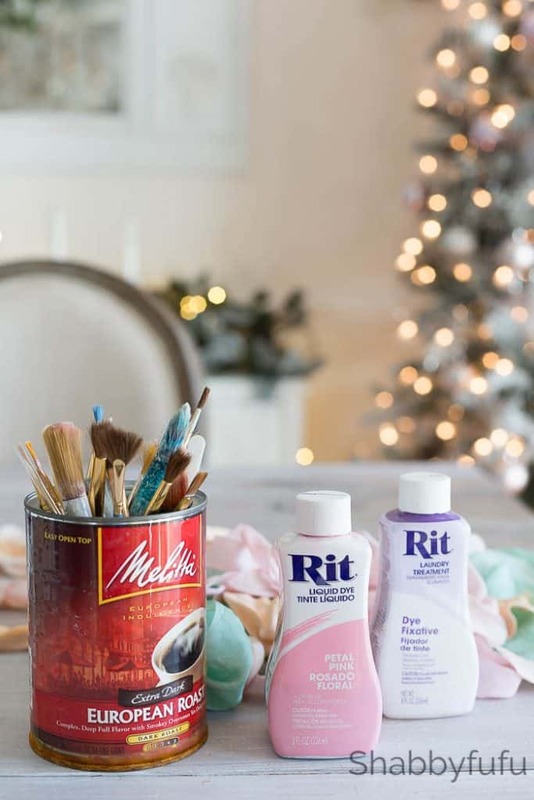 Learn How To Hand Paint Ribbon with these easy ideas in this tutorial DIY. 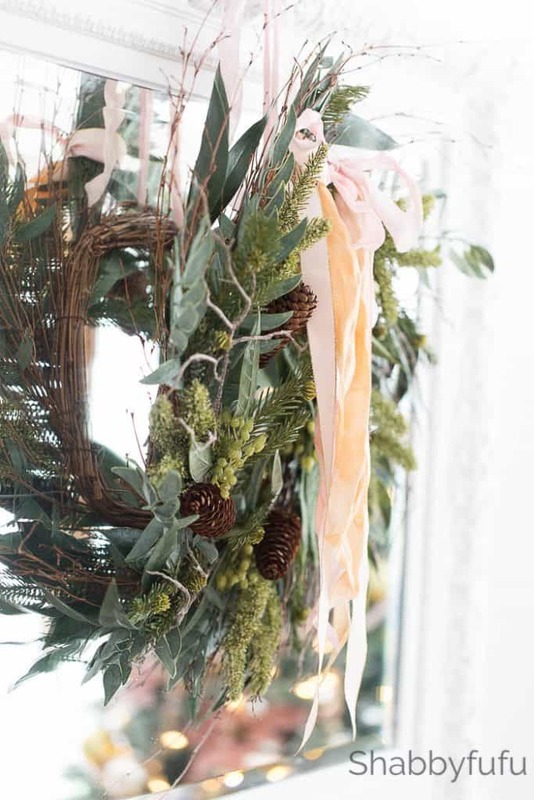 Do you love to adorn packages or wreaths with beautiful ribbon? 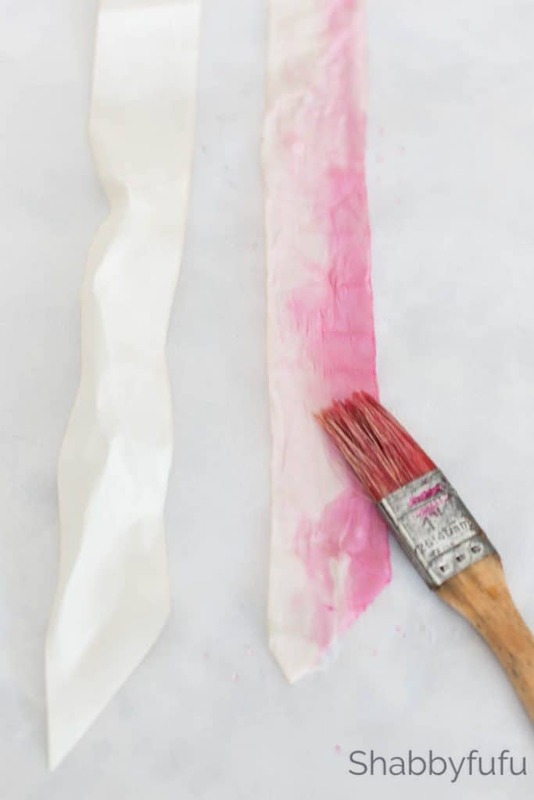 I have some very simple techniques to share that you can use to make hand painted ribbon that has a watercolor effect that is stunning! 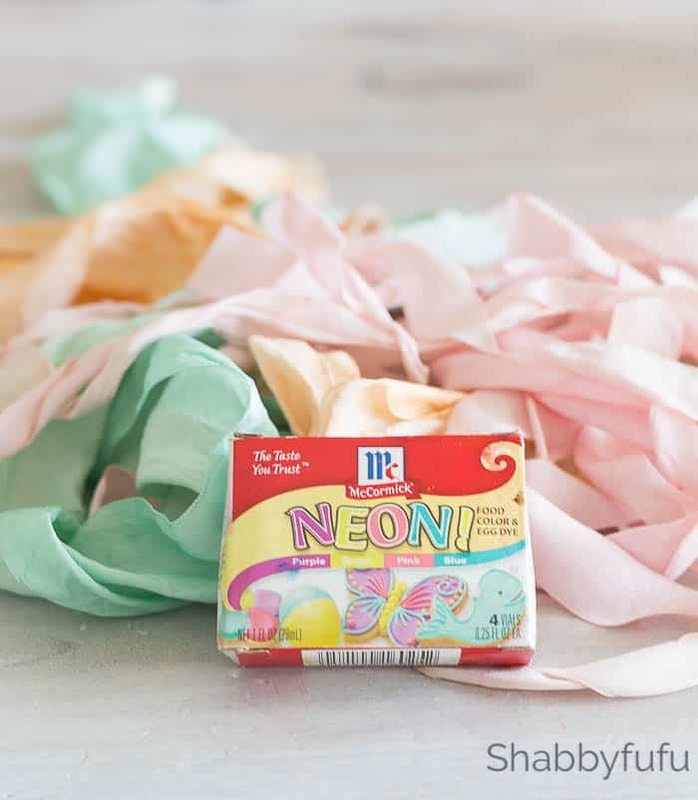 You can use ribbon for so many things and it’s one of my favorite ways to embellish projects. I also enjoy wrapping up a bundle of ribbon and tying it together to give as a gift to a creative friend or using it to give a bouquet of flowers! 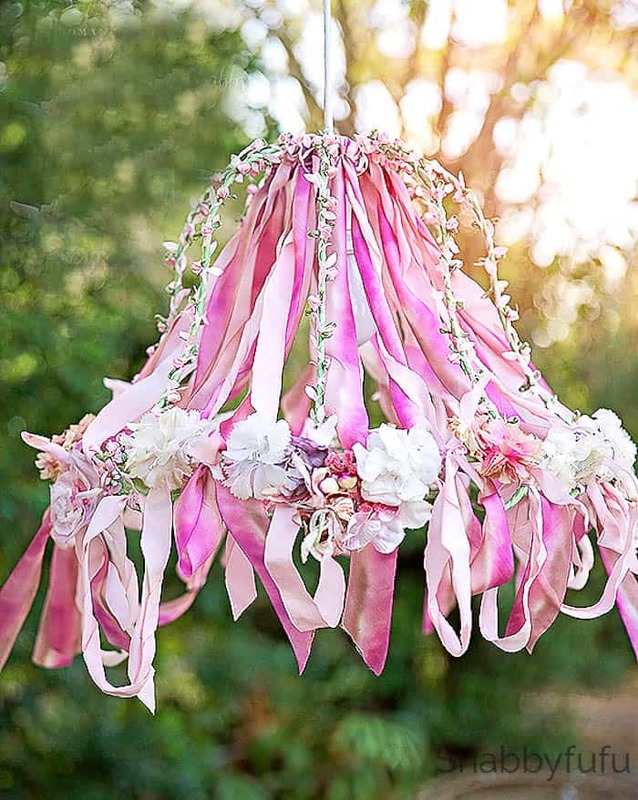 Have you seen my RIBBON CHANDELIER from THIS POST? The ribbon has been hand painted and has a beautiful ombre effect. Ribbon is perfect for rolling and making RIBBON ROSES and I have a tutorial HERE for an easy no-sew method. 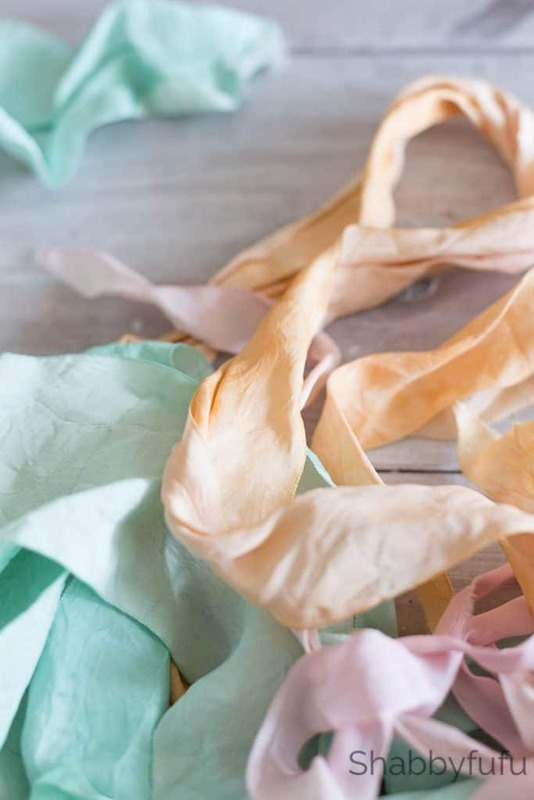 These ribbons look like sherbet or candy…of the prettiest kind…but aren’t edible. Hand painting your ribbon can be done with a variety of techniques and I’ve tried several. Some have been more successful than others and I prefer to hand paint ribbon rather than dye ribbon by the dip technique because you have more control over how the color will look. 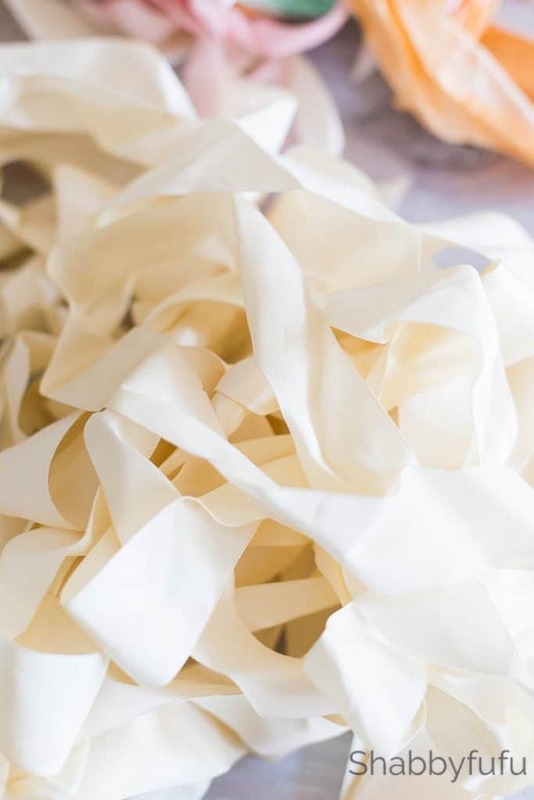 The ribbon pictured above is silk and it’s vintage (what a surprise:-) but you can use raw or undyed new silk ribbon found on-line. To give ribbon interest, I like to dampen it and scrunch it up before the painting process. 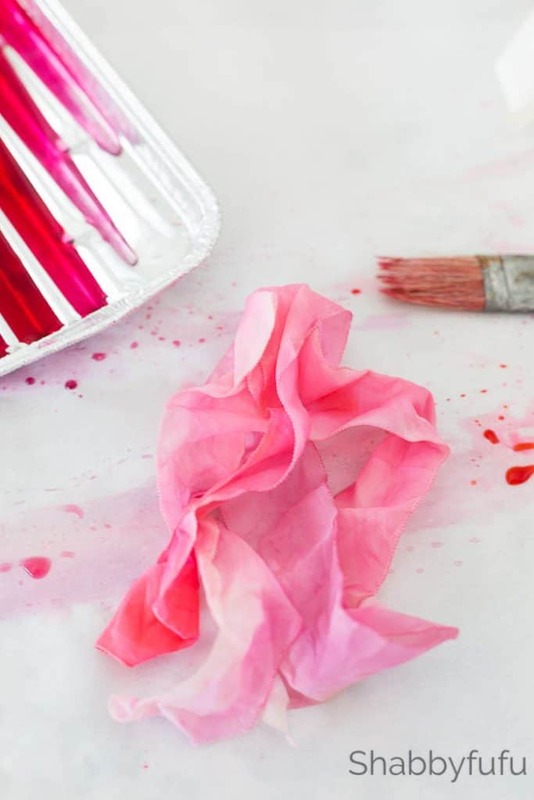 You can paint your ribbon when it’s still damp or if you prefer stronger color…paint when dry. I generally scrunch up my ribbon when wet and paint it this way, but I suggest trying both ways to see what YOU like. 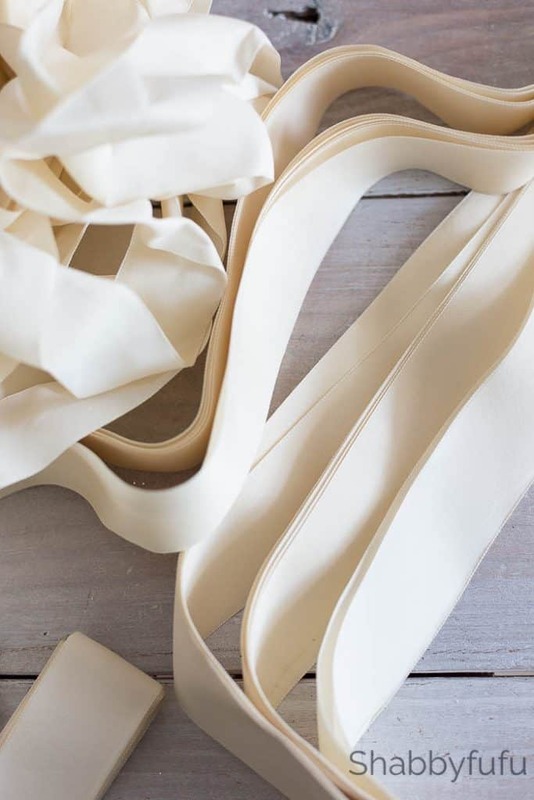 Another way to be super THRIFTY is to rip up some old white cotton into strips that would be the size of ribbon and paint it! I’ve done this and left the edges raw and it looks stunning! Gather your supplies while your ribbon is drying off a bit. You don’t want it soaking wet, you want to paint the ribbon while damp. I use a variety of brushes from my studio and various dyes. Liquid Rit Dye is one of my favorites and comes in lots of scrumptious colors. 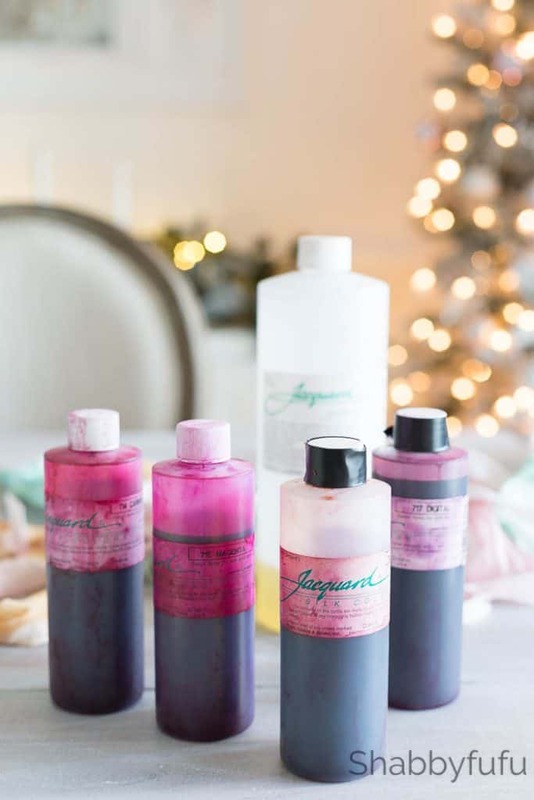 The Jacquard Silk Dyes are what I used for my RIBBON CHANDELIERS and although they are made for silk you can use them on cotton as well. A little bit goes a long way and I’ve had these bottles for years! 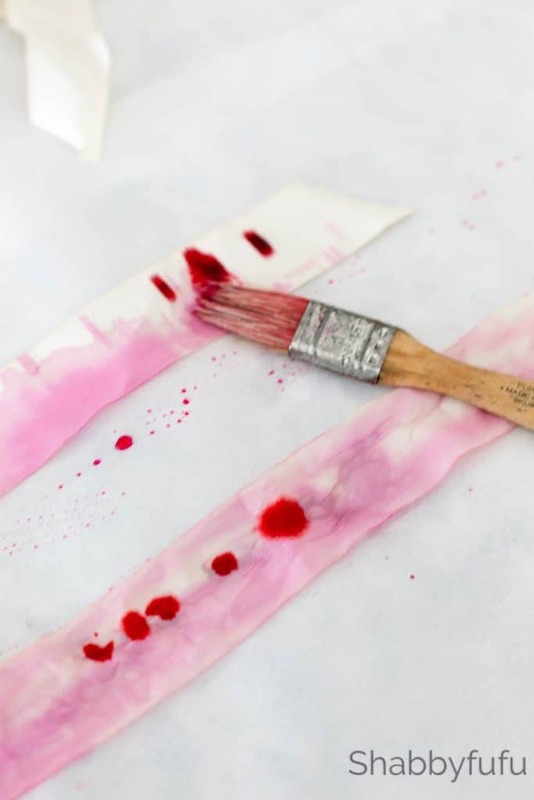 Good old FOOD COLORING can be used to paint ribbon and fabrics as long as you set the color in. Setting the color wouldn’t be as important if you are crafting ribbon for projects that won’t be washed, but out of habit I generally do set my colors. More on that in a minute. 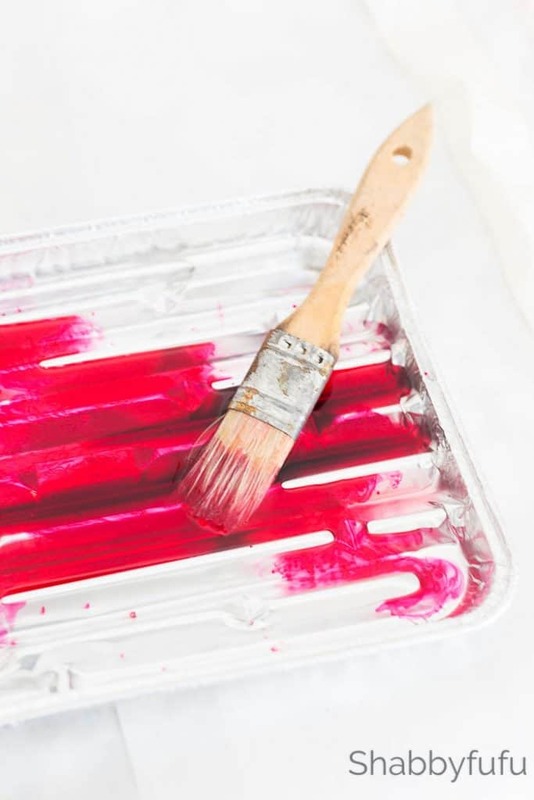 Working with dyes is a messy job, so cover all surfaces with a dropcloth or butcher paper and wear gloves. It’s really tough to get fabric dye off your skin and clothing…I’ve learned this the hard way! When hand painting with dyes you’ll want to thin out the dye quite a bit. There’s not really a set ratio, so you’ll want to experiment. I take a shallow pan or plastic tub or cup and fill with water and add my dye a couple of drops at a time. You can always add more with dyes but it’s difficult to remove it…so go slow and see how the colors work. 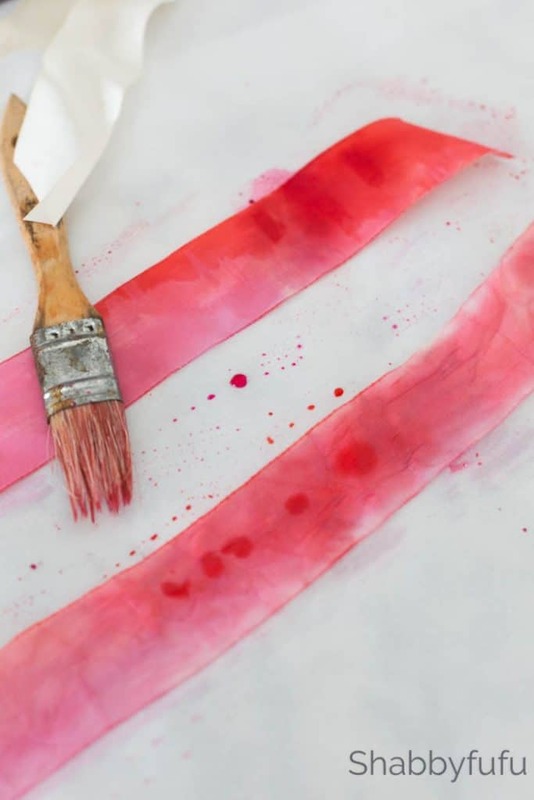 Painting ribbon is much like painting with watercolor paints…and you can also use watercolor or even watered down acrylic paint (I prefer dye). With damp ribbon dip your brush into the watered down dye and paint on one end of the ribbon as shown. Your dye will bleed and that’s a beautiful thing, so let it happen and experiment! 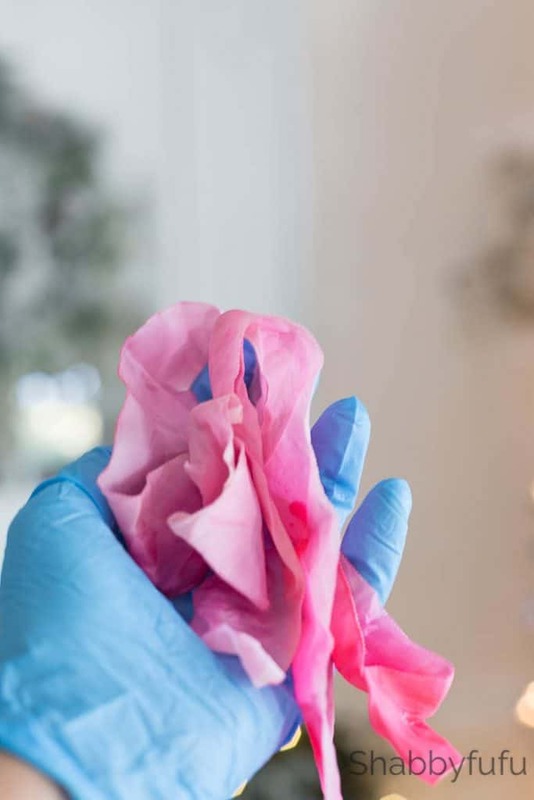 Mix your colors and keep adding more water to the ribbon to let the dye bleed in through the fibers in an ombre effect. I’ve mixed two different dyes in my pan and painted on one side of the ribbon with the deeper pink and on the side with the more pale pink above. Keep in mind that your ribbon will have a darker appearance when it’s wet and will look lighter when dry. Scrunch some more to give a tie-dyed effect and if you feel that the color is too vibrant, try rinsing under cool running water to allow some of the unset dye to run out. These ribbons are for a project that I want to be vibrant and you can be in total control of your color for your own ribbon dying needs. 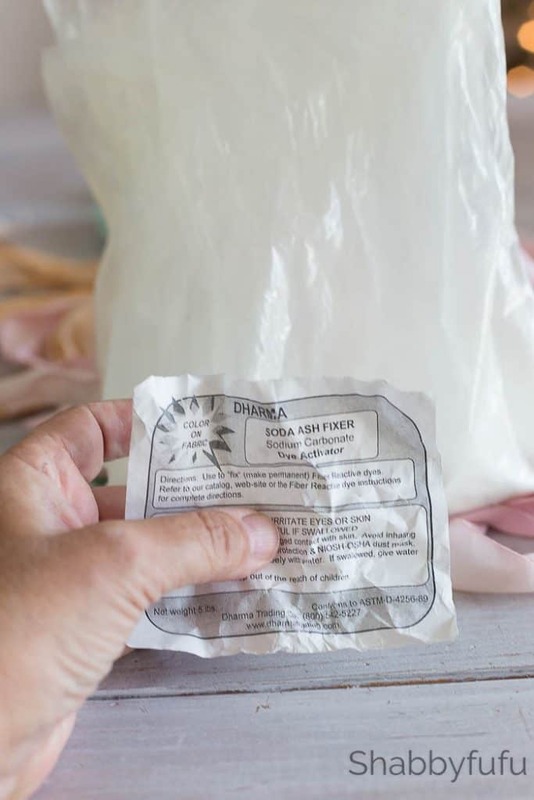 To set your dye you can use a soda ash fixative as above (follow package instructions) or plain table salt in a small fresh bucket of hot water. Salt is salt, so either will work! Dissolve the water into the bucket and soak your ribbon for about 20 minutes to set. I generally use about a half cup per quart of water and then rinse the ribbon out in cool water. Squeeze and run through the dryer until it’s dry or dry outside on a sunny day. Yes please…more craft ideas and instructions. I will try and do that. Seems to be what my readers really like and I appreciate your helpful comment Karen. I love your crafts and would love to see more with your special touch. Nancy…thank you so much for letting me know! I’ll be sure to include more crafts, and love to think up new ideas to share. I love the decorating ideas, but I am also. a crafter, so YAY for those posts you have too! 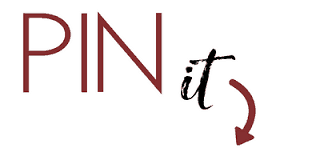 So happy to hear that you want more crafting posts and I have some in the works!